A chart of Ohio Utica Shale Well Status by month highlights drilling downturn, production buildup, and drilled backlog. While wells entering production has slowed, according to the EIA, Utica Shale Production continues to increase month over month. 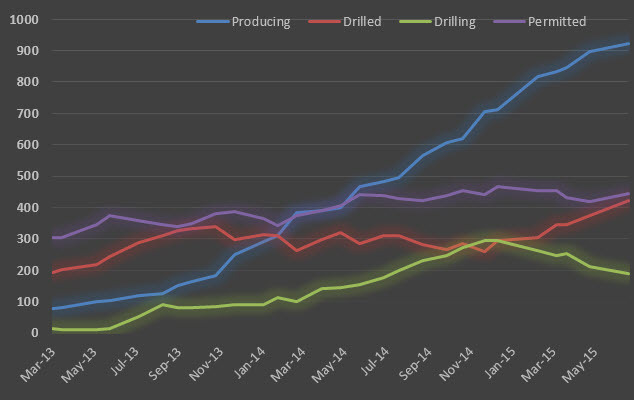 See related post Utica Shale - Net Gas Production Soaring Past Others. And while the EIA Utica Shale report includes more than just Ohio, Ohio is the main contributor. Drilling has tapered, though still above 2014 levels... so far. And while wells classified as drilling peaked near the end of 2014 / beginning of 2015, drilling activity is still just above activity this time last year, though that will change if the drilling decline continues at the current rate. At the same time as drilling began to slow, wells classified as drilled but not yet producing has increased. This trend is likely due to operators awaiting more favorable gas prices or they negotiating with service providers and holding out for discounts on completion services required to bring wells under production, all most likely related to economics. A healthy pipeline of wells ready to drill has maintained, indicating the under favorable economics the wells will be ready to drill.